To minimize travel cost for remote Southern California clients, Peter can arrange to use Metrolink, AMTRAK, MTA etc. that serve those areas. 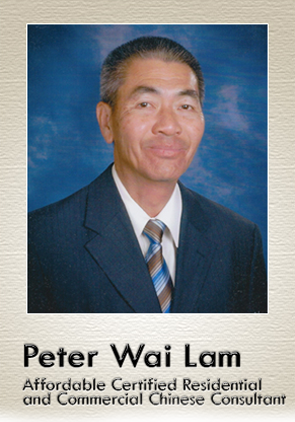 Peter Wai Lam is a member of the American Feng Shui Institute in Monterey Park, California where he has completed numerous advanced courses for professional Feng Shui Consultants. He was born and raised in Hong Kong, China where since childhood he was able to benefit from valuable auspices and expertise of his family relatives who were trained practitioners of contemporary as well as traditional Feng Shui. Individuals with problems related to finance, health, career, relationships, romance, fertility, depression, mourning/recent deaths etc. Owners of restaurants, office complexes, warehouses, retailers who have reported increases in profit and auspiciousness following consultation. Restaurant Feng Shui is one of Peter’s specialties. Real estate buyers and Realtors who understand the importance of checking out the Feng Shui compliance of their properties prior to costly investment commitments. Peter has also been highly successful in helping owners and Realtors with difficult-to-sell properties due to poor Feng Shui. Copyright © 2012 PeterWaiLamFengShui.com. All rights reserved.